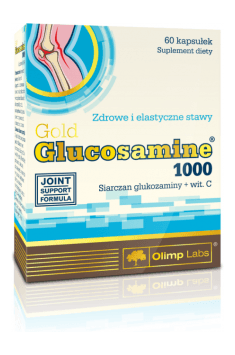 Olimp Labs Gold Glucosamine 1000 is a preparation in capsules containing glucosamine sulphate and vitamin C – substances necessary for proper construction of the joint cartilage. Research has shown that glucosamine is a substrate in the human body necessary for the biosynthesis of proteoglycans that form and maintain connective tissue, including cartilage. Glucosamine – a glucose derivative which is the precursor to proteoglycans, sialic acid or chondroitin. These compounds are important components of the extracellular substance and play a significant role in the proper functioning of connective tissue, including bone and cartilage tissue. Vitamin C – a water-soluble vitamin, essential for the functioning of the body. It acts as a coenzyme for enzymes involved in the synthesis of collagen (proline and lysine hydroxylase), which is the most commonly occurring protein in the human body. The correct structure and the right amount of collagen is essential for healthy bones, skin, joints or teeth. Due to this, deficiency of this vitamin, and consequently, insufficient amount of collagen, is the cause of defects in collagen structures, such as blood vessels or joints. Teeth loss and impaired wound healing are also characteristic in that case. Glucosamine contained in this supplement is a substrate for extracellular components synthesis, and therefore it indirectly affects the condition of connective tissue in our body, which contains the most of this substance. It forms, for example, membranes surrounding our internal organs, but also cartilage or bone tissue. The aforementioned components of the extracellular substance are also present in bones, so their increased amount may favourably affect bone durability. Apart from bones, structures rich in connective tissue include the skin, tendons and ligaments. Collagen - fibrillar structural protein is also present in these structures in large amounts. It forms a kind of scaffolding for many tissues and organs, including the skin. The presence of collagen determines, for example, its proper firmness and strength, delays the appearance of wrinkles, strengthens the walls of blood vessels (which prevents bruising), can also strengthen the teeth and all elements of the osteoarticular system (ligaments, tendons, joints). The formation of collagen in our cells is a complex process. At one of its stages two enzymes from the group of hydroxylases are involved, which cannot act without vitamin C. The vitamin contained in this supplement, apart from obvious health benefits, also ensures constant collagen production, which contributes to maintaining healthy and durable bones and other organs mentioned above. To sum up, Olimp Labs Gold Glucosamine 1000 preparation provides a solid dose of glucosamine and vitamin C. Glucosamine is a precursor to important components forming our bones and cartilage. It supports proper functioning of the joints, strengthening joint cartilage, as well as bones, ligaments and tendons. Its action is perfectly complemented by vitamin C, necessary for the synthesis of collagen, which is the most important structural support for the aforementioned structures, enhancing their endurance. Microcrystalline cellulose - filler, magnesium salts of fatty acids - anti-caking agent, capsule (gelatin - capsule component, color: E171).